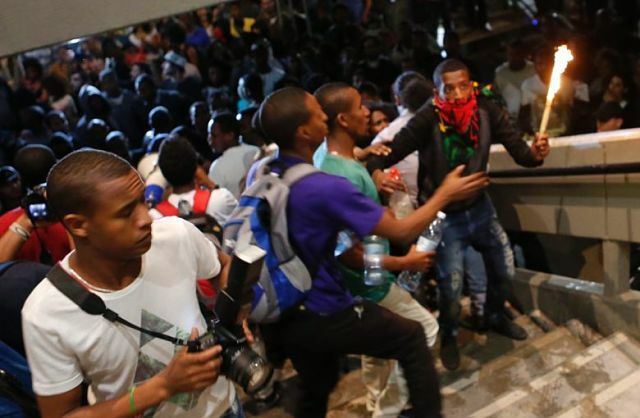 TEL AVIV — A protest on Sunday by thousands of Ethiopian-Israelis and sympathizers against police harassment and brutality turned by nightfall into a chaotic and unusually violent confrontation with the police in the center of Tel Aviv. The demonstration began peacefully in the afternoon with protesters blocking main thoroughfares of Tel Aviv, paralyzing the heart of the city for hours as officers looked on and stopped the traffic. Later, demonstrators hurled stones, overturned a police vehicle and clashed with the police in Rabin Square. Officers responded with stun grenades and water cannons. About 46 people were slightly injured, half of them police officers, and at least 26 protesters had been arrested by midnight, according to the police. The police said that agitators had stirred up the atmosphere. Many here compared the cry of the young, angry generation of Ethiopian-Israelis who came out on Sunday to the tensions in American cities like Baltimore or Ferguson, Mo., that have been roiled by friction between blacks and the police.